Harry Kleinschmidt holding pictures of his graduation from QBI. Harry Kleinschmidt, our first residential graduate (class of 1949), passed away peacefully last Friday, 15 March 2019 at the age of 100 years old. 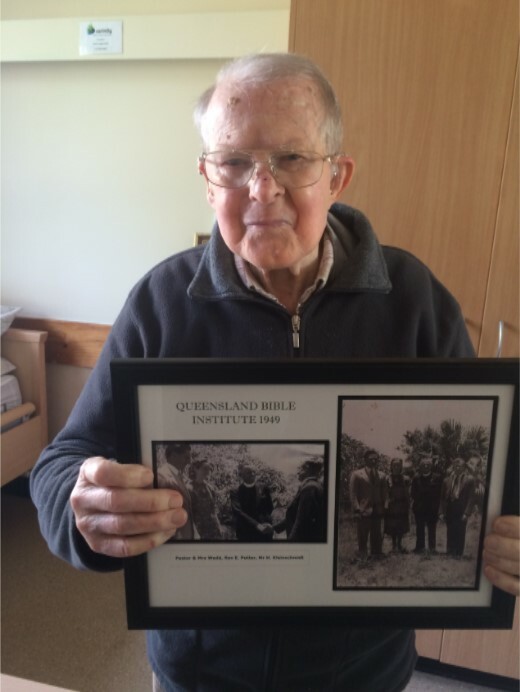 Before commencing studies at then QBI in 1948, Harry worked as a farm labourer. 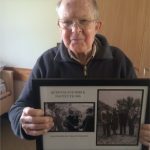 When WWII broke out, he was called into the army and served in New Guinea where a friend led him to Christ. On completion of his studies in 1949, Harry joined Aborigines Inland Mission, now known as Australian Indigenous Ministries (AIM). His first posting was to Woorabinda. After 18 months he returned to Brisbane to marry his sweetheart Audrey and together they returned to serve the indigenous community in Woorabinda. After eight years in Woorabinda, Harry and Audrey moved to Moree where their ministry included church services, Sunday School teaching, cottage meetings, open air meetings and visitations to outlying towns. Following Moree, they spent six years in Townsville where Harry’s ministry included visits to Charters Towers and to Stuart Creek jail. He would also make trips, often in rough conditions, to Palm Island where there was a large aboriginal community. The subsequent years where spent at Inala where Harry and Audrey faithfully served with indigenous people. They were known as “Mum and Dad” to many. Even in his older years, Harry continued to support the work of AIM and other Christians ministries in prayer. Harold Charles Kleinschmidt received the Distinguished Graduate Award in recognition of his faithful service among the indigenous people of Australia in association with AIM. It was a joy for us to be part of his 100th birthday celebrations where he told us that he still prayed for BST! Harry is survived by his wife Audrey and their three children, Pamela, Paul and Mark. What a life lived in the faithful service of Christ!